Light curve of OGLE-2017-BLG-1522. Credit: Jung et al., 2018. Using microlensing technique, astronomers have found a new giant planet orbiting a brown dwarf located in the bulge of the Milky Way galaxy. The newly discovered exoplanet, designated OGLE-2017-BLG-1522Lb, is most likely 25 percent less massive than Jupiter. The finding is reported March 14 in a paper published on arXiv.org. Based on the gravitational lens effect, the microlensing method is mainly used to detect planetary and stellar-mass objects regardless of the light they emit. This technique is therefore sensitive to the mass of the objects, especially to low-mass planets orbiting beyond the so-called "snow line" around relatively faint host stars like M dwarfs or brown dwarfs. Such planets are of special interest for astronomers, as just beyond this line, the most active planet formation occurs. The OGLE-2017-BLG-1522 microlensing event was detected August 7, 2017 by the Optical Gravitational Lensing Experiment (OGLE) using the 1.3m Warsaw telescope at the Las Campanas Observatory in Chile. Afterward, an international team of astronomers, including scientists from the OGLE Collaboration and the Korea Microlensing Telescope Network (KMTNet) Collaboration, has analyzed the event and found a system composed of a brown dwarf orbited by a giant planet. 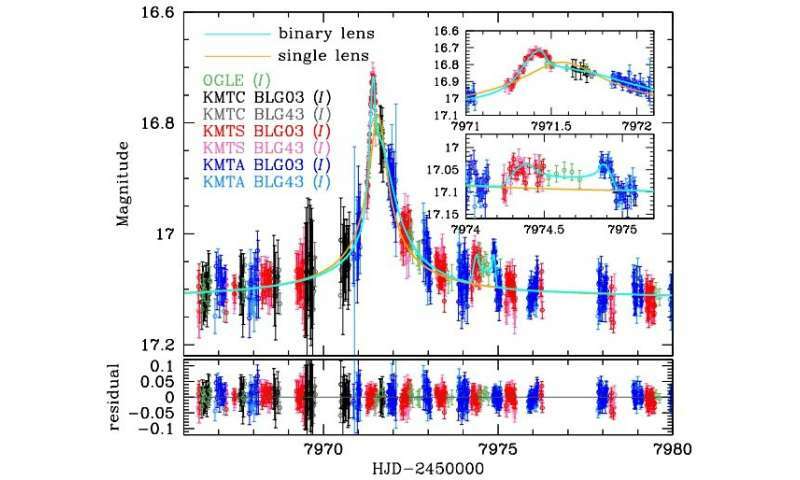 "We report the discovery of a giant planet in the OGLE-2017-BLG-1522 microlensing event. The planetary perturbations were clearly identified by high-cadence survey experiments despite the relatively short event timescale of tE ~ 7.5 days," the researchers wrote in the paper. According to the study, OGLE-2017-BLG-1522Lb is a giant planet with a mass of about 0.75 Jupiter masses, orbiting its host at a distance of about 0.59 AU. The researchers noted that they are 75 percent sure that the host is a brown dwarf approximately 46 times more massive than our solar system's biggest planet. Therefore, additional observations should be conducted in order to definitely confirm whether the host is a low-mass star or a an intermediate-mass brown dwarf. The projected companion-host separation indicates that OGLE-2017-BLG-1522Lb is placed beyond the snow line—the distance at which molecular species freeze, thus where the planet formation starts. Moreover, the authors of the paper calculated that the system is located in the galactic bulge. In concluding remarks, the astronomers underlined the importance of their discovery, noting that OGLE-2017-BLG-1522Lb could be the first giant planet orbiting around a brown dwarf host having a planetary mass ratio. "Planet formation scenarios combined with the small companion-host mass ratio q ∼ 0.016 and separation suggest that the companion could be the first discovery of a giant planet that formed in a protoplanetary disk around a brown dwarf host," the scientists concluded. We report the discovery of a giant planet in the OGLE-2017-BLG-1522 microlensing event. The planetary perturbations were clearly identified by high-cadence survey experiments despite the relatively short event timescale of tE∼7.5 days. The Einstein radius is unusually small, θE=0.065mas, implying that the lens system either has very low mass or lies much closer to the microlensed source than the Sun, or both. A Bayesian analysis yields component masses (Mhost,Mplanet)=(46+79−25,0.75+1.26−0.40) MJ and source-lens distance DLS=0.99+0.91−0.54 kpc, implying that this is a brown-dwarf/Jupiter system that probably lies in the Galactic bulge, a location that is also consistent with the relatively low lens-source relative proper motion μ=3.2±0.5 mas yr−1. The projected companion-host separation is 0.59+0.12−0.11 AU, indicating that the planet is placed beyond the snow line of the host, i.e., asl∼0.12 AU. Planet formation scenarios combined with the small companion-host mass ratio q∼0.016 and separation suggest that the companion could be the first discovery of a giant planet that formed in a protoplanetary disk around a brown dwarf host.